Sen. Lamar Alexander suggested student borrowers have loan payments automatically withdrawn from their paychecks, an idea that could help stem a rising tide of defaults but also raises concerns about student privacy and how the idea would be carried out. Alexander, the chairman of the Heath, Education, Labor and Pensions Committee, is hoping to complete an update to the higher education law (Public Law 110-315) by the end of the year. The Tennessee Republican laid out his vision for a bill this week that would streamline loan repayment options and allow students to choose payments based on a percentage of their discretionary income. “Under this new repayment system, students will have a manageable payment and most will completely pay off their loans, which is good for the student and is good for the taxpayer,” Alexander said at an appearance at the American Enterprise Institute. Sen. Lamar Alexander (R-Tenn.) is proposing allowing automatic deductions from paychecks of those owing student debt as one way of cutting down on loan defaults. Automatic withdrawals would be expected to reduce the number of student borrowers entering default. A million borrowers defaulted last year and 1 in 10 borrowers who began repayments in 2015 were in default three years later, according to the Education Department. Yet questions abound among financial aid administrators, advocacy groups and lawmakers about the risks and complications around automatic repayments. It could be done, but there would be trade-offs, said Jason Delisle, a higher education fellow at AEI who has studied the policy. Under Alexander’s proposal, borrowers would need to let their employers know they have student loans, although employers wouldn’t know how much debt they have. 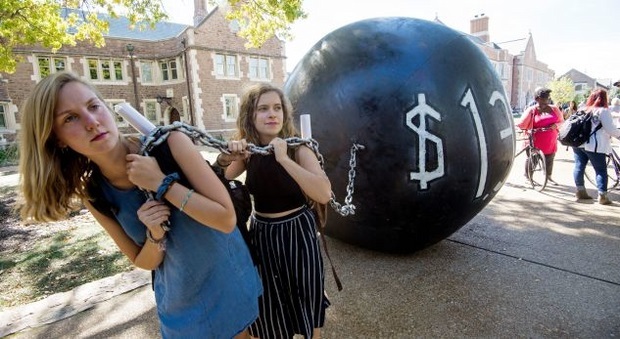 That could cause some anxiety for borrowers, said Allie Aguilera, policy and government affairs manager with Young Invincibles, a student advocacy group. “Students have a significant amount of consternation around how this information could be used by employers to target them for extra hours or dangle their jobs over their head because they need to pay their loans,” she said. Such a system could require employers to know whether an employee’s spouse also had student loans, because taxes are often paid as a household. It would also need to consider what would happen when borrower have two or more sources of income and could lead to students needing to fill out a more complex tax form, Delisle said. But Congress faced a similar challenge with allowing data from the Internal Revenue Service to be used to help families fill out the form for federal student aid, said Sandy Baum, a fellow with the Urban Institute’s Center on Education Data and Policy. The details of how Alexander expects automatic withdrawals to work is not yet known. He and ranking member, Sen. Patty Murray (D-Wash.) have yet to begin talks this year on updating the higher education law. He’ll also have to work to get his House counterparts on board. Automatic payment wasn’t mentioned in either Republican or Democratic higher education bills last year. There were concerns that automatic payment would reduce pressure on colleges to lower costs, a Democratic aide on the House Education and Labor Committee said. On the Republican side, payroll deduction is “a complex idea worthy of discussion,” Marty Boughton, a spokeswoman for ranking member Rep. Virginia Foxx (R-N.C.), said in a statement. “We look forward to those discussions,” Boughton said.